Introducing the Ultimate in everyday carry…The Blade-Tech Ultimate Klipt. The Ultimate Klipt is the newest addition to our customer favorite, Easy-on/Easy-Off Klipt line. The Ultimate Klipt boasts everything you’ve come to know and love about the Klipt holster with the addition of advanced features to increase function, concealment and all-day comfort. Our Blade-Tech exclusive, Low-Profile Concealment Attachment eliminates the potential for printing by slightly changing the angle of your firearm grip inward, towards your body. The positive-lock trigger guard audibly clicks, signaling that your holster is secured in place. 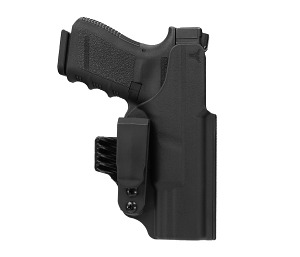 A quick-draw speed cut on the body of the holster provides a tactical advantage by allowing the firearm to be drawn rapidly at a moment’s notice. Shirt-tuck capability on the Easy-On/Easy-Off belt clip design provides the convenience of wearing this holster no matter what the occasion calls for while arming you with grab and go capability since you do not have to remove your belt to put on this holster. The Ultimate Klipt is precision-molded out of highly durable polymers, with dual sweat guards to withstand even the toughest use while maintaining maximum comfort. Carry with comfort, convenience, and confidence when you carry the Ultimate Klipt.